Choosing your home's best exterior house colors can be a challenge. Paint sets the tone for a home. It can make home buyers more eager to see a house or drive them away. With that said, homes are different, and what works for one home may not work for another. For example, a country house may look good in neutrals while a beach house may look good in pastels. If you’ve decided to paint your home’s exterior, take time to choose the best colors. Painting a home is a difficult task so you must make sure you get it right the first time. 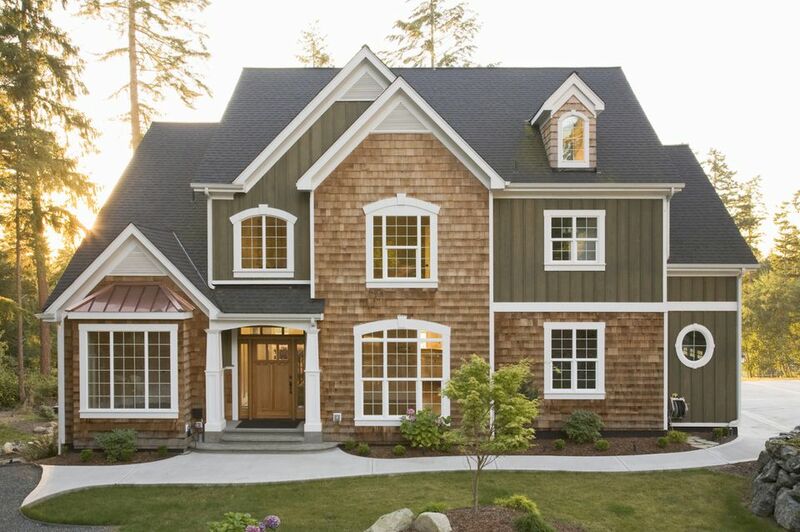 Use these fine points to select the best exterior house colors for your home. If you decide to leave your brick natural take a look at neighboring homes and get color palette ideas from their inspiration. Since you aren’t doing a complete renovation, you should examine the lasting elements – like stonework, tiles, and roof shingles – before you pick exterior colors. Most of these features have undertones that might affect your palette. Some are cool, others are warm, while others are bold. The brick might have dark gray flecks while roof shingles might have a blue cast. Choose paint colors that will harmonize these fixed elements. Pay attention to details such as roof lines - the fascia, and other roof details can use accent colors. Columns, shutters, window and door frame trim and your front door color can be sources of accent paint colors. Thinking of what color to paint your brick home? There are some things you should keep in mind. First, ask a contractor to build a miniature brick test wall from plywood. Position it to face the street like your home. Look at it during the day, at night, when it is sunny, and when it’s cloudy. Paint color is usually affected by the environs, the shade, the sun, the weather, and the time of day. Secondly, remember that painted brick houses soak up some of the paint’s pigment, hence the color will be lighter on the house than on the chip. Thirdly, make sure the color you choose coordinates with the roof color. Painting a house is like becoming an artist. You agonize over the colors, try several shades, and repeat the entire process again until you succeed. All this can take a lot of time and effort. If you want to save time, talk to house painters, designers, color consultants, and even architects. There are also apps that can help you to select great paint colors. Professionals have a wealth of experience and can advise you on the outdoor paint to use. Don’t Forget To Look Around! Your home's curb appeal and exterior colors should be based on the surroundings of your home. They affect the entire street and potential buyers can easily notice if you chose the wrong ones. Before you go out to buy outdoor paint, assess your neighborhood. Some neighborhoods have homes with similar color schemes while others have homes with custom colors. Choose unique colors that blend in. For instance, you can choose ivory instead of white. Choosing the right paint finishes can be almost as hard as choosing paint colors. This is because the finishes you use can determine how the colors you’ve used look. If you choose great paint colors and bad finishes, home buyers will notice that something is off. When choosing paint sheen, remember this rule of thumb: a high sheen has a good shine and the higher the shine the longer it will last. Paint finishes are categorized into 5 types: flat/matte, eggshell, satin, semi-gloss, and high gloss. Each one performs a particular function and decorative job. Your home’s architectural style is what gives it its character. Choose paint colors that emphasize the style and don’t downplay it. There are specific color schemes for art deco homes, Craftsman bungalows, and contemporary abodes. If your home is older, visit a paint manufacturer and inquire about the colors you can use. Many have compilations of historically accurate colors and can make your work easier. You don’t have to choose the very same hues unless your neighborhood codes say otherwise. But don’t make common staging mistakes like choosing too many contrasting colors if you want to create a pleasant effect. Choosing exterior house colors is not as hard as it seems. All you need to do is arm yourself with great tips and tricks.